Gaiser says he had one woman with their company who they trained and she did well. She did so well that the federal government hired her. 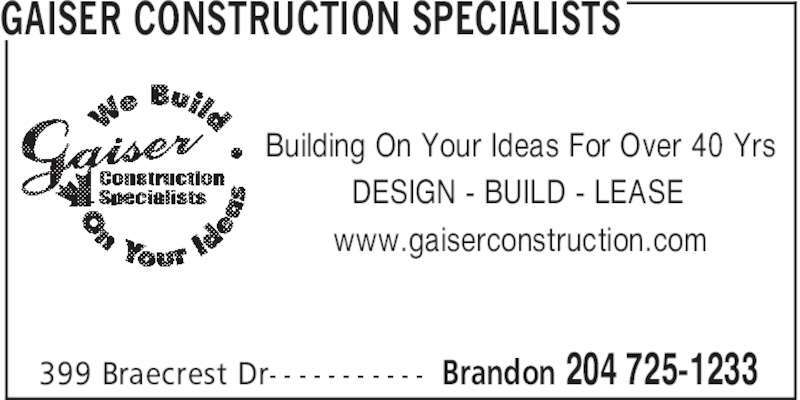 Another man was traveling miles and miles to get to Gaiser Construction Specialists. The company did some projects in his hometown and came to know about the work – soon he was hired on in his local town. Some of their strategic alliances include working with the school boards on rooms for children with disabilities. This is a project worth $75,000. “We’re doing a hospital of 4,000 square feet and that’s about a $6 million job,” says Gaiser. “It’s all soup to nuts…it’s all based on the customer and what they need. Customer service, that is really the foundation of what we do. We as contractors build on an understanding and a set of drawings. We are always building on the understanding of what they need us to do. You have to understand how the process of the training and the education is going, like on Extreme Makeover it’s a makeover with Ty [Pennington] and motivating people. You need that inner satisfaction when you’re doing a project. That’s the customer service side of things.